In 1909, the Parliament of the Grand-Duchy of Baden entrusted the Chamber of Agriculture with the creation of an experimental distillery in Oppenau. Its purpose was to produce pure and genuine brandies for sale all over the world and to bring fame to Baden's fruit brandies. Since its foundation, Kammer-Kirsch has had but one objective: the production of genuine and exquisite noble fruit brandies. To this day, continuous refinement remains the golden rule of the Kammer-Kirsch Distillery. As superior quality requires, the only way to distill a brandy of the highest natural purity is to use select, fully ripened fruit. Kammer's extraordinary quality is achieved through a careful double distillation. Their master distillers perform their high art throughout the various steps of production. From the fruit to the brandy, they use exclusively the finest and tastiest substances. A long maturation in glazed earthenware jugs at the constant cool temperature of deep vaulted cellars then gives the brandies their exquisite taste and inimitable fruity bouquet. 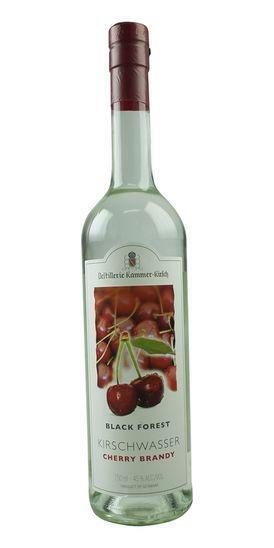 Kammer fruit brandies are best served slightly chilled and neat in an Armagnac glass or Champagne flute. They make an excellent digestif after a meal. Although the delicate nature of Kammer brandies make them ideal on their own, a tablespoon with Champagne or sparkling wine, then garnished with the corresponding fruit makes a delightful cocktail. Or add 1 oz. of brandy to coffee for an after-dinner drink. In addition to being an after dinner drink, soaking fruit in Kammer infuses it with flavor, or they can be poured over ice cream.